The Arena met all Americans with Disabilities Act (ADA) standards during its original construction. We pride ourselves in continually striving for compliance with ADA standards. All seating configurations include sufficient numbers of disabled seating spaces to meet ADA standards. Signage to assist the disabled is posted throughout the building. The disabled loading / unloading zone is in front of Gate A. Disabled parking spaces are available in the Arena parking lots. TDD phones available. Volume controlled public pay phones. Assistive listening headsets are available to hook into the house system, when applicable. A signer can be obtained with 30 day advance notice. All restrooms are accessible to the disabled. Cut-away curbs and ramps. Wheelchair accessible restrooms, public pay phones, and drinking fountains. Concessions are open during most events. The concession stand accepts cash or credit cards. See individual show listing for children's entry policy. Now open to the public, the Arena has already proven to be a smash-hit. Since its dedication on June 19, 2003, the 3,500 seat arena has been the centerpiece of the Toms River Regional School District. 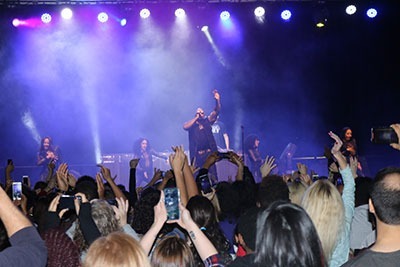 The Arena is scheduled to host a variety of events such as professional and varsity sporting events, live music concerts, trade shows, and much more. The Arena's primary purpose is to serve the student population as a state-of-the-art facility that can accommodate a myriad of student activities - from varsity basketball games to high school graduations. The arena will also bring local, regional and world-renowned entertainment to the community, helping to generate funds for the school district for years to come.